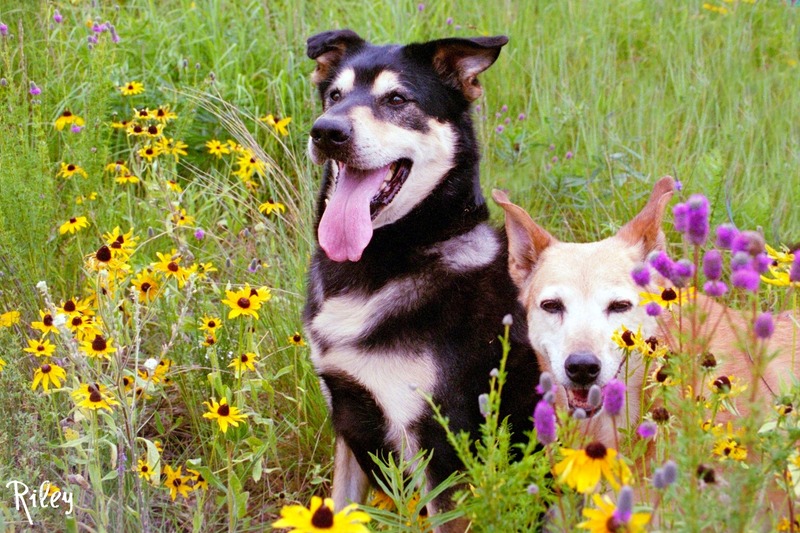 Banshee the Chinook and Abby summer in Minnesota wildflowers. These are questions we get a lot from customers — hopefully the answer will help you feed your dogs more easily. Water is the most important piece of feeding pets, and all pets need a constant supply of clean, fresh water. Water is important all year, but this is especially true during warm weather. Using a smaller bowl and refilling it often is a great way to keep your pet’s water supply fresh. Want to really be on top of the water portion? Be sure to wash the water bowl every day. Your wonderful new puppy companion should be eating at least three times a day. Four is better, but we are assuming you are working to support your new friend. By the time your puppy is six months old, you can gradually cut back to feeding two times a day. You dog should stay on the twice daily feeding from this point forward. The twice-daily feedings let your dog digest their food correctly and it helps keep their metabolism working at a proper rate. What type of food should I choose? Dry food (kibble) is the easiest alternative. The kibbles help keep your pup’s teeth and gums healthy and clean. Look at the back of the food bag and read the AAFCO statement. It should read something like this: “formulated for all life stages” or “formulated for growth,” this means it is designed to support your puppy’s development. Some small pups have difficulty chewing the kibble. If yours is one of these, you can always add a little warm (not hot) water to the food. This will soften the kibble and help them chew the pieces more easily. Ideally you will select a food that falls into the “Super Premium” or “Premium” categories. The meat source should be in the first ingredients. These foods are higher priced, but actually end up costing about the same or even less than the brands available at the grocery or discount stores. The better the quality, the better the health of your puppy. Another big plus with the super premium foods is fewer stools. That means less pooper scooping which is always a good thing! Your growing companion is not likely to be overweight, and probably can eat as much as they want when they are small. Puppies that gulp down the food and gorge themselves until their bellies are like little basketballs should be fed smaller amounts more frequently. Most pet food manufactures have feeding guidelines on their bags. As a general rule, these guidelines will be higher than the amount most pups need in a day, although some pups will need more than the suggested feeding amount. Use these guidelines as just that, a rough guide for how much the pup should eat. If your pup gets loose stools after eating too much, cut back by 10% until the stools are better formed and you have found a happy medium. Challenge feeding means the food is available for a brief period of time and then is taken away. Remove any leftover food after the puppy has had a chance to eat what he wants. (15 minutes is usually sufficient.) By removing the food, your house training will be successful more quickly and if your dog is ever sick and doesn’t eat, you’ll know something isn’t right, right away. Eating a meal strongly stimulates your puppy’s desire to eliminate. By taking pup out shortly after eating, when you know he wants to “poop,” you can get your pup into the habit of doing the socially acceptable thing, and get praise for doing something right. What a smart puppy you are! Some pups will need to go outside immediately and some will take up to 15 minutes. You will know once you start studying pups behavior what time is the right time. Most puppies are good eaters. If you have gotten one that is reluctant, you can always add a little canned food to the kibbles. Again, stick with a super premium or premium food to keep your pup as healthy as possible. Foods that are mostly liver may be too rich and give pup the “trots” so look for something like chicken, lamb or turkey. Can I give my puppy cow’s milk? Yes, if you want to risk your pup having diarrhea. Most pups don’t tolerate cow’s milk very well, so best to just avoid it. Why isn’t my puppy eating as much? Many puppies will start regulating how much they eat as their bodies start requiring less food. This is normal. The majority of puppies have achieved most of their growth at about six months. You will need to start watching how much your puppy is eating and perhaps begin to cut back on the daily food allotment. Your puppy should have a nice covering of flesh on his body. (Not a parka-like covering.) You should be able to feel the back ribs when you run your hands over the puppy’s sides. When looking at your puppy from above, your pup should have a “girlish figure” that looks like an hourglass. The shoulders are the top of the hourglass, the waist is the middle and the hips are the bottom. We are not looking for a Scarlet O’Hara wasp waist here, just a moderate hourglass. From the side, there should be a slight tuck up after the back of the rib cage, before the hind legs. Your veterinarian can teach you how to look for these attributes and to determine if Fido is fit or fat. What type of food should I feed? The same guidelines apply to the adults, super premium or premium kibbled food works best. AAFCO should state “for all life stages” or “for maintenance of adult dogs.” For older or overweight dogs, look for a formula that is geared specifically for them. You will want a meat source as one of the first ingredient. Dry kibble is the simplest way to feed your adult dog, just like it is with your puppy. Twice a day is ideal for most adult dogs. Try to feed at the same time each day to enhance digestion and promote perfect potty habits. If your older dog is not as healthy as he should be, your can add a third or fourth feeding to help with the digestive process. Big dogs should be fed on a platform to aid in digestion. The good rule of thumb is bowl height should keep the neck horizontally level with the floor. Why should I challenge feed my adult? Can I feed canned food? Canned food is fine for your pet too. (Remember the super premium and premium foods are best.) Cans are more costly than dry, but dogs really liked the canned option. A good solution with canned food is to add some into the kibble and use it for variety in your dog’s diet. Pay attention to your dog and how fit he is. A really active dog will need more food than a sofa surfer. Again, most manufacturers have recommended amounts on the bags and cans of food. These are usually higher than the average dog needs. Look at your dog everyday to determine how their body looks. The same girlish figure applies to the adult dogs, as does the feeling the back ribs as you run your fingers over the dog’s body. Your veterinarian can help you determine the ideal weight for your dog, and will have a scale to check your progress on dogs that need to gain or lose weight. Thanks for stopping past. Be sure to visit our web site Dogfooddirect.com and “Like” us on Facebook for exclusive offers and contests.